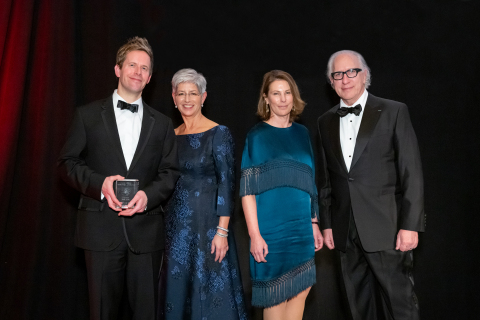 LOS ANGELES--(BUSINESS WIRE)--The authors and screenwriters behind the film “Leave No Trace,” and the television miniseries “A Very English Scandal” received the 31st-annual USC Libraries Scripter Award at the Feb. 9 ceremony at USC’s Doheny Memorial Library. The Scripter Award recognizes the year’s best adaptation of the written word for the screen, and includes feature film and television adaptations. In the television category, the selection committee chose “A Very English Scandal,” written for the screen by Russell T Davies for the streaming network Amazon Prime. It is based on John Preston’s 2016 nonfiction book of the same name, which details the 1970s scandal involving British Liberal Party leader Jeremy Thorpe and his wayward attempts to silence a former lover. Due to a tie in the nominating round, six television shows were eligible this year. The other finalists were the writers behind episodes of “The Assassination of Gianni Versace: American Crime Story” (distributed by FX), “The Handmaid’s Tale” (Hulu), “The Looming Tower” (Hulu), “Patrick Melrose” (Showtime), and “Sharp Objects” (HBO). In the film category, the winners were writer Peter Rock, author of the novel “My Abandonment,” and screenwriters Debra Granik and Anne Rosellini, who adapted for the screen Rock’s work, itself an adaptation of a 2004 local news report about a Vietnam veteran and his young daughter found living off the grid in the forest near Portland, Oregon. “Leave No Trace” was released by Bleecker Street. The other finalist films were “Black Panther” (distributed by Disney), “Can You Ever Forgive Me?” (Fox Searchlight), “The Death of Stalin” (IFC Films), and “If Beale Street Could Talk” (Annapurna Pictures). In-kind donors to the event included Mariner Books, Other Press, and Urth Caffé. Scripter began in 1988, co-founded by USC Libraries board members Glenn Sonnenberg and Marjorie Lord. For more information about Scripter—including additional images from the ceremony—visit scripter.usc.edu.